If you’re considering starting kitesurfing – or a member of your family is, you may be wondering if it’s the right sport for you. Watching kitesurfers in action can be intimidating! It sometimes feels like these people have superpowers to be able to go so fast and jump so high in incredibly high winds. So, can anyone learn to kitesurf? A person of any age, weight, height, gender, and physical strength can learn to kitesurf provided they are reasonably healthy, feel comfortable in the water, have decent aerobic endurance, balancing skills, and coordination ability. Let’s look at each of these aspects in a bit more detail. Can people of any strength kitesurf? Can people of any size and build kitesurf? Can people of any age kitesurf? Can people of any fitness level kitesurf? Can people with all mental capabilities kitesurf? Can people not comfortable in the water kitesurf? Can people with lower back issues kitesurf? Most people who are new to this sport believe you need a lot of upper body strength to kitesurf. That’s actually the case for windsurfing, but kitesurfing is different. All of the traction from the kite goes into your harness, which you wear around your waist. As a result, you don’t need any strength whatsoever in your arms to kitesurf! Your core muscles are the ones handling the power from the kite. Your arms are merely used to steer the kite using the control bar, sort of like on a bicycle. That’s why you see a lot of smaller riders, male or female, riding effortlessly in all sorts of winds. Now, what you do need, is some minimum strength in your legs, abs and lower back. 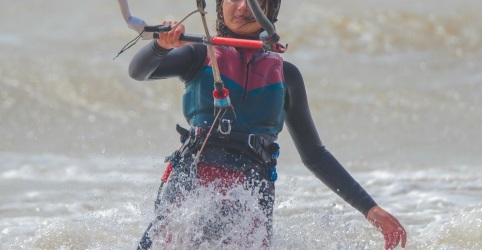 The reason is as the kite lines pull on your harness, you must push back and apply an opposite force from your core muscles to resist the pull, keeping you body straight, and pushing with your legs onto your board and against the water. However, you don’t need any superior fitness skills for that, most healthy people are able to resist the pull from the harness and keep their body straight while simultaneously pushing on their legs. Of course, this is assuming you have the right size kite for the current wind conditions and are not highly overpowered – in which case much more strength is required to counter the pull. Most schools require that learners weigh at least 40 pounds in order to enroll in kitesurfing lessons. 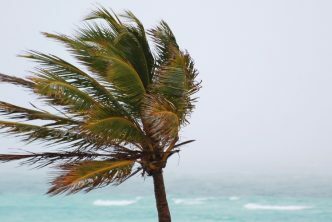 Children below that weight are too likely to get swept off by a strong wind gust. Smaller children, meanwhile, can practice on a trainer kite – a smaller, handheld kite that lets them learn the basic skills of flying a kite, steering it left and right, and controlling its power by generating or reducing the kite’s traction while standing on the beach. What about if you’re a heavier person? Can you still kitesurf? Sure you can. It’s not uncommon to see people in the 250-300 lb range kitesurfing. Heavier people just need a larger kite, and possibly a larger board, particularly in light winds. See this post for more on kitesurfing as a heavy rider. Of course, if you’re really overweight there could be other health aspects that can make it inadvisable to start kitesurfing, such as your overall cardio endurance and heart condition. What about height? If you’re a taller than the average person, that shouldn’t have any effect on your ability to kitesurf. Remember, all of the traction takes place at your waist through the harness, so height doesn’t really come into play. One caveat is spine issues, which many tall people tend to suffer from – see below for more about that. If you’re shorter than average, you can also kitesurf without issues. The only thing you may need is to adjust the control bar to make sure you can reach it at all times, including when it all the way up – the bar slides up and down a rubber part to adjust the tension in the lines connected to the back of the kite. Some bars are set up go up quite high, possibly to a point you can no longer reach it. There’s no minimum or maximum age for kitesurfing. As I’ve mentioned, upper body strength is not a factor. Children as young as 5 can start kiting as long as they have the minimum weight required. Older people with good coordination and balance, sufficient core strength and lower body stamina, can also practice kitesurfing. When you look at the kitesurfing population at most local spots on an average weekend, you see a lot of people in their 30s, 40s, and 50s cruising back and forth. Riders in their 20s are typically into freestyle, that is high jumps and tricks. Freestyle generally requires a higher level of fitness, mobility, flexibility, and ability to take hits than regular navigation. Older people are more likely to kitesurf in less extreme conditions, e.g. in steady winds in the 15-25 range and relatively flat water. I’ve mentioned upper body strength, weight, and height, and age are not very relevant factors in determining whether or not kitesurfing is for you. But how about general fitness? Although many schools like to make it sound like a walk in the park, the truth is kitesurfing is an endurance sport. While most people without major health issues should be able to learn to fly and control a kite on the beach, getting into the water, getting up on that board, and then riding upwind for long durations does require some serious stamina. So what exactly are we talking about? For one thing, you need to be able to stand on your kiteboard and stay up while your kite is pulling you at the waist. This requires good balancing skills to make up for the forward pull in your harness which tends to drag you off your board. To make things harder, the wind is rarely constant, which means the amount of pull on your waist varies a lot every second. You need to constantly adjust your balance to remain standing on your board. To master the difficult exercise of maintaining constant tension in your lines and traction on your harness to build up speed, you have to continuously extend your legs and push against your board using your glutes, quads, and calves. Meanwhile, you pull back into your harness using your core muscles to help maintain that tension in the lines. Doing this for hours on end can be exhausting. Most healthy people build up the muscles for it as they go, making their kitesurfing sessions increasingly longer. Be aware, though, that a minimal level of endurance and fitness, similar to running on a treadmill, will help a lot. By “mental capability” I’m not referring to people with a mental handicap, but rather to mental skills, an aspect rarely mentioned when assessing people’s ability to kitesurf. Kitesurfing is in some aspects similar to drumming: it requires very good coordination skills. Of course, you build these skills over time, and kitesurfing schools have processes to help you achieve this. However, you do need to have at least some amount of natural coordination skills. Both may quickly react to the smallest movement or position change you make (depending on your kite and board types). Learning the right positions and movements for controlling each requires good mental skills. Some people naturally have it, while others don’t. I started learning to kitesurf at the same time as a good friend of mine. While my learning evolution was on par with other learners around me, my friend kept slamming his kite onto the sand, then into the water. He quickly gave up kitesurfing as he felt he wasn’t wired up for it. Of course, he may have been able to overcome this and teach his body anyway. But I guess he felt it was too much work for him – in contrast, he’s a very good tennis player. 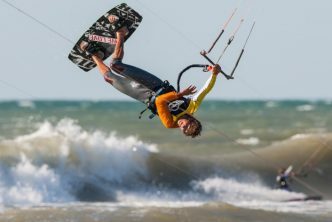 Just be aware of that, not everyone has the mental and body coordination necessary to learn kitesurfing – it may require a lot more effort for some people. Determination is another fundamental factor that will help you become a kiteboarder. This is an obvious one, but essential nevertheless: if you don’t feel comfortable in the water, chances are you’ll have a hard time learning to kitesurf. Some people take up kitesurfing hoping it will help them cope with their fear of water. In reality, though, you’ll need all the peace of mind and concentration you can get to successfully do a water start, get up on your board, throw your kite into the power zone, and start riding. If you feel anxiety from being in the ocean (or a lake) it will very likely get in the way of learning to kitesurf. Also, you should at least be able to swim before you kitesurf. Sure you may wear an impact or safety vest when riding, but there will be times, especially during the learning process, when you’ll need to swim back to shore. Basic swimming skills are a definite prerequisite – after all, this is an ocean sport. The last thing I want to mention is whether you can kitesurf if you have lower back pain. Disclaimer: I’m not a physician or health professional, so take this with a grain of salt. A couple of years ago, I had a nasty lower spine injury with 2 herniated discs (L4 and L4). I was stuck on a couch for 3 months and couldn’t stand upright for another 3. The first thing I did when I started feeling less pain was to re-educate my spine using the Foundation Training method, which worked miracles on me (and thousands of others). But guess what the second thing I did was? Go kitesurfing. This actually helped me recover from my herniations. Why is that? The way the harness pulls forward on my lower back (spinal extension) and forces me to flex my core muscles and extend my legs works well for me. It’s actually helping me perform lumbar extensions, which is what I need for my condition. Not everyone is the same. A good friend of mine, a highly experienced kitesurfer, has a strong lordosis – meaning his lower back has a relatively deep inward curve, causing him pain. In his case, flexion-based exercises are what he needs – making a round back. Kitesurfing tends to extend your spine, and that’s bad for him. So whether or not you should kitesurf with lower back problems depends on your specific condition. Checking with a doctor may result in a no-no answer. If you feel up for it, just book a lesson on a low wind day and check if having the harness pull on your lower back makes you feel better or worse. Check out my post on the kitesurfing and back pain.